Or maybe not; apparently he’s backtracking and not sure now. As you may know Apprising Ministries has been monitoring the rapid apostatizing going on within mainstream evangelicalism; and the fact that rebels against God’s Word like Brian Houston are gaining respect within wider evangelicalism is yet another example. A couple of examples; just a few days ago we had T.D. Jakes Presents Word Faith Leadership Conference where Houston was a headliner. 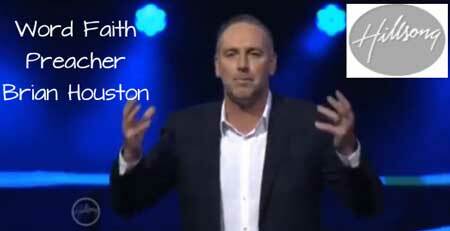 You might remember that in 2012 he was brought in by Rick Warren as you can see in Word Faith Preacher Brian Houston of Hillsong Church, Australia Speaking at Saddleback Church. Sadly, as hyper-charismania and its parallel track of Contemplative Spirituality/Mysticism continue to spread throughout younger sectors of the evangelical community so does a phony unity being promulgated by the deceitful spirits (cf. 1 Timothy 4:1) who’re speaking to practioners of charismania. This is not of God. 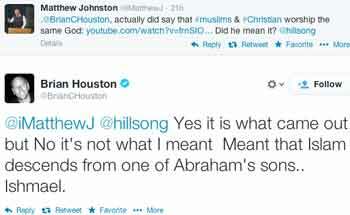 It would seem pretty clear above that Brian Houston has just told us those who adhere to the world religion of Islam, the followers of the prophet Muhammad, are serving the same God as those of us who are regenerated believers in the one true and living God of the Bible, the followers of Christ Jesus, the Lord. what pagans sacrifice they offer to demons and not to God. I do not want you to be participants with demons. So, the Christian is forbidden to have anything to do with the god of the Muslim, let alone to serve their demon(s) impersonating God. In closing this, for now, let’s take a little closer look at what Brian Houston is attempting to teach us as he asks: “How do you view God in a desert?” I assume the desert would symbolize our world. One lives off dead carcasses, rotting meat. The other lives off the beautiful, sweet, nectar in a particular flower, on a particular desert plant, in the same desert. We have both the Muslims and the Christians in the same “desert” (our world? ); then Muslims (vultures?) apparently seek after the “dead carcasses, rotting meat” (of the Qur’an?) while Christians (hummingbirds?) prefer the “beautiful, sweet, nectar” of the flower (the Bible?) But then his metaphor completely breaks down. Houston opines, “They both find what they’re looking for.” No, they don’t. If the food’s supposed to bring the sustenance of a relationship with God, the faithful Muslim won’t find the Gospel of repentance and forgiveness of sins in Jesus’ Name in the Qur’an. Extending Houston’s metaphor, the vultures will only starve and die eternally. Again, it’s merely a guess on my part as to what Brian Houston was trying to accomplish with this teaching because I don’t presume to know what’s in his heart. It seems to me that he was trying to be Muslim-friendly; and from his tweet, apparently Houston’s under a very common, but mistaken, impression about Islam. Far too many professing Christians today believe that Islam is an Abrahamic faith; but as I said earlier, it’s own tradition reveals it originated with a demon. I’ll leave you with the following comparison of the god of Islam and the one true and living God of Holy Scripture in the Bible from Christianity and Islam—The Same God?